As we saw last time in this space, Matthew’s purpose in giving us an apparent grab-bag jumble of miracle stories in Matthew 8-9 is to show that he gives us the power to live out the new law of the new covenant given on a new mountain by a new Moses. As we also discussed, there is a golden thread that connects all those seemingly random miracles. What is it? Let’s take a look. 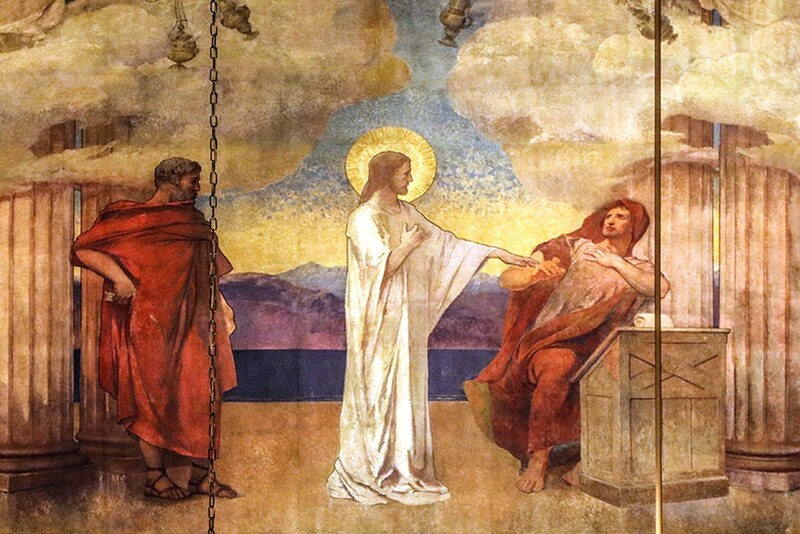 It is notable that the very first miracle of healing recorded by Matthew is that of a leper. What is even more notable is the method Jesus chose to perform this miracle. He could have said, “Be healed!” and that would have been enough (as he showed when he healed the centurion’s servant (Matthew 8:5-13)). But instead Jesus does something very deliberate and significant: he touches the leper (Matthew 8:3). Now under the old covenant, such an action was regarded as defiling. Touching a leper meant you were ritually defiled and could not go up to the Temple to worship. It meant you had to go through a whole week of purification. Uncleanness, sin, and defilement were understood to be more powerful influences than cleanness, sanctity, and purity. In the old covenant, sin was the superior power. When someone afflicted with some ritual uncleanness that symbolizes sin touched someone who was clean, the “flow” of power went in one direction only: the clean person was defiled but the unclean person was not sanctified. However, when Jesus touched the leper something astounding happened: the leper became clean and Jesus was not defiled. The flow of power was, for the first time, reversed. But not everyone can see this. For the Pharisees have learned the right lesson but drawn the wrong conclusion from the law of Moses. Under the old law, ritual defilement was intended as a kind of sign or shadow. It was meant to show us in our pride that we could not, by our own strength and power, keep ourselves clean from sin. The power of sin is greater than our power of sanctity. So the Pharisees understand sanctity in only one way: separation. Indeed, the word “Pharisee” comes from the Hebrew term meaning “separate”. They reasoned that if the power of sin is greater than our power of sanctity then the solution was to separate themselves from all that was unclean and even all that had touched what was unclean. In short, they apply to their personal lives a ritual code that was originally intended only for the Temple. They attempt to keep themselves as pure as the priests serving in the Temple. And so they separate themselves from the Gentiles, from touching the dead and dying, from lepers, and from menstruating women. Naturally then, when Jesus appears on the scene, they simply do not know what to do with him and are motivated by their pride to misunderstand him. Jesus, in Matthew 8, turns the Pharisaic understanding of the law on its head. He touches lepers and they are healed (Matthew 8:1 4), receives Gentiles and they receive faith (Matthew 8:5-13), consorts with demon-possessed people in a cemetery and they are restored (8:28-31), and, in the next chapter, permits the touch of a menstruating woman and she is healed (Matthew 9:18-22), touches the dead and she is raised (Matthew 9:25), and eats with tax collectors and sinners and makes them saints (Matthew 9:9-13). Yet, in all this, they see only the ritual defilement, not the revolutionary reversal in the flow of power. For, as Jesus points out elsewhere, pride has blinded them (John 9:35-41). They are so certain they are clean they cannot say, “Lord, if you are willing, you can make me clean.” And so they miss the crucial lesson that the time for separation is past. In Israel’s childhood, separation from uncleanness and sin was necessary just as it is necessary for us to keep our children from “bad influences” lest they become imitators. But with the dawn of the power of the Kingdom of Heaven, it is the bad influences that are to be conquered with good ones, sin that is to be conquered with virtue, and death that is to be conquered with life. Next articleEditorial: what good is a politician, and what good do they serve?